It's time to do life differently. Living Upp is a lifestyle design company that teaches individuals and organizations how to use an 8-dimensional framework to create better health, more balance…and a little adventure. Our planning & design tools, such as the Lifestyle Design Studio and The Self-Care Planner, include a wide range of simple strategies to help you do life differently. Because life’s too short to live a sh*tty one. I’m Stacy Fisher, the founder of Living Upp. As a registered dietitian, certified diabetes educator and lifestyle coach with more than 19 years of experience in the healthcare industry, I’ve worked in private practice, in medical facilities, and with large companies such as Dell, Boeing, and Nike. Learn more about my background and training here. Ready to design a healthy lifestyle? All of our products and programs are based on an 8-dimensional framework that is deeply rooted in self-care. 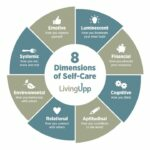 In my book Uppward: A Self-Care System for Purposeful Living, you can learn more about the 8 Dimensions of Self-Care and how to use it to design a life you love. At its core, self-care is a preventive health strategy involving actions and behaviors that improve, restore, or maintain good health. It’s also a simple and cost-effective strategy to reduce our nation’s ever-increasing cost of healthcare. Shhhh…self-care is a quiet approach to healthcare reform. Self-care helps us grow deep roots, so we stay grounded when an unexpected storm hits. And the truth is, some of life’s storms can be downright nasty, knocking us down and leaving us wondering if we even have the strength to get back up. What was your storm? The loss of a loved one? An ended relationship? An illness? A career change? My storm came several years ago when I found out that my marriage was failing. My entire world fell apart and I was barely functional. I realized then just how totally unprepared I was, and that’s why I created the 8 Dimensions of Self-Care — to help pick myself up from that heavy moment and help others do the same. We can’t stop the storms, but we can help you build a stronger roots. The Lifestyle Design Studio is an online community for individuals who are ready to make a serious commitment to their health, so they can experience better health, more balance…and a little adventure. The Self-Care Starter Kit is designed for independent learners who prefer self-paced learning and have no problem staying accountable to their goals. The Self-Care Planner will help you focus on what matters most by helping you organize your personal AND professional life all in one place. (a free copy of The Self-Care Planner is included with an annual studio membership. The 8-Day Self-Care Challenge is a great option if you’re looking for some new self-care ideas to incorporate into your personal practice. Follow our blog for a playful (and sometimes highly emotional) perspective on self-care and lifestyle design. Subscribe to our mailing list and we’ll deliver a weekly warm-upp to your inbox so you can stay informed about lifestyle design tips, products, programs, and other important news. Is it time to do life differently? Living Upp is a participant in affiliate programs, which means we earn a commission from qualifying purchases. Pages on this website may include affiliate links to Amazon and other affiliate sites. Permissions [GDPR COMPLIANCE] Click this checkbox to officially give us permission to send you periodic emails. If you ever want to opt out, you can easily unsubscribe at any time.